The Hmong are an ethnic group originally from the mountainous regions of Southeast Asia. They have been relocated throughout their history, but have still maintained a strong sense of cultural identity and independence. Most of the Hmong living in the United States today came from Laos. In the 1960s and 1970s, the Central Intelligence Agency recruited thousands of Hmong men to fight against the encroaching communist regime as part of the “secret wars” of Laos. As the communist regime gained control of the country after the war, Hmong soldiers and their families were persecuted for their participation against the regime and thousands of people fled their homes and villages to refugee camps located in places like Thailand. The United States, along with other Western countries, received many refugees from the wars in Southeast Asia, including Vietnamese, Cambodian, Thai Dam, and the Hmong peoples. American non-profits, churches (many Lutheran), volunteers, and refugee sponsors helped refugees make the transition to life in the U.S. Hmong families began arriving as early as 1975 and today there are over 200,000 Hmong in the United States, mostly in Wisconsin, Minnesota, and California. Decorah and other rural towns in Iowa were among the first destinations for many Hmong families. The Southeast Asian Refugee Services (later the Northeast Iowa Refugee Coordination Services) program was established in 1979 to coordinate support programs to help smooth the transition to a new culture and language. There were education programs for tutoring in English as a second language, job placement projects, and volunteers to help the Hmong navigate their new lives in Decorah. One important way that the Hmong families earned some income was to sell their handmade crafts and textiles, such as story cloths. Hmong textile design was traditionally used for clothing, and contained an array of intricate shapes and designs. Following the war, Hmong women applied their skills to new textile forms that were intended for western audiences in order to generate income to help provide livelihood for their families. 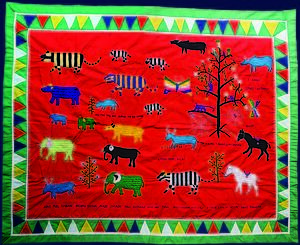 Story cloth folk art likely originated in the Thailand refugee camps, as the Hmong refugees were encouraged by missionaries and United Nations workers to tell their stories through embroidered narratives. 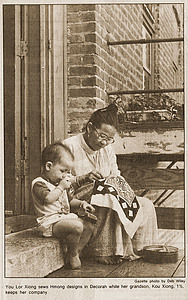 Hmong artists were supplied the materials while in the camps and sent completed cloths to the United States and other western markets for sale. As Hmong artists resettled to places like Decorah, they continued to make story cloths in order to provide income for their families. Hmong Agricultural Story Cloth, E1114. Artist unknown. This cloth depicts the agricultural cycle of a Hmong family. Story cloths are hand stitched and embroidered, depicting different daily life scenes, animals, festivals, and more. They are usually brightly colored, including intricate embroidery. Many represent stories that demonstrate the rich history and tradition of the Hmong. Most well-known story cloths include images of refugees fleeing from the conflict or portraying scenes during the war, as well as showing agricultural practices. This cloth displays a variety of animals native to eastern Asia. Animals are an important part of Hmong tradition, and are incorporated into countless stories and folktales. Tigers, for instance, are featured in many Hmong stories. In the case of our animal story cloth, many of these artists were learning English through bilingual programs and practiced on the cloths by labeling items or describing scenes. You also may notice the one line of Hmong writing, which describes the rat eating corn. An interpretative display created by Jessi Kauffman ('16) and Rachel Wiebke ('16), exhibited on first floor Koren 2015.